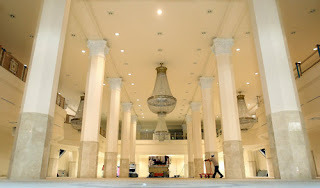 This entry was posted in A Legendary Event, event decor, event design, events, extraordinary events. Bookmark the permalink. 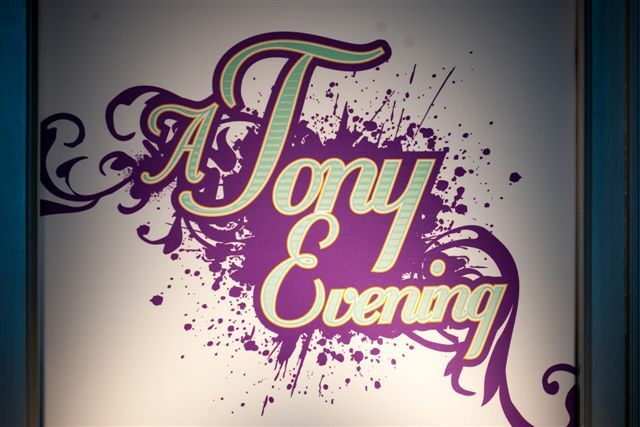 The New Loews Hotel set the perfect stage for this last weekend’s gala, A Tony Evening. All of the raised proceeds benefited the Alliance Theatre. 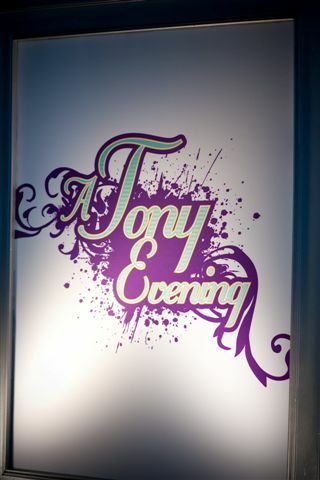 Our talented event designer, Sophia Lin made it a stylish and upscale atmosphere that blended the setting of the hotel with an artistic rendition of A Tony Evening logo. The logo, which captured the essence of classic style and elegance with filigree patterns, portrayed a contemporary edge with its paint-like splatter design and unconventional color scheme. Sophia also utilized a mixture of soft and bold purple tones combined with dark blue, turquoise and gold, and jewel tones that dramatically came to life with the neutral hotel palette. The step and repeat was anything but traditional! Sophia found her inspiration for the step and repeat on on the red carpet at the this year Grammy’s. The centerpieces for the tables were a perfect marriage of traditional beauty mixed with modern style. Each centerpiece was constructed with a composition of stacked clear and turquoise colored glass for a glistening effect with the room lighting. 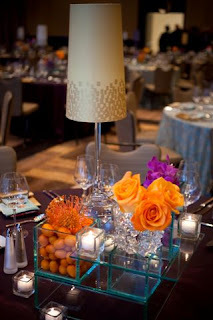 These centerpieces contained a mixture of golden and orange toned florals mixed with deep purple blooms. Conventional florals such as hydrangea, roses and tulips were mixed with orchids, mums and other bold florals for a full yet simple look. A sleek crystal base table lamp was added to the composition and topped with an ivory tapered shade. 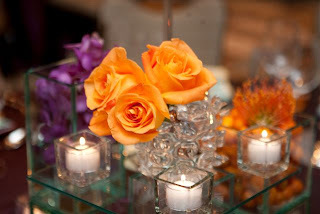 Square votives were also used in the centerpiece, which again created a sense of modern style. The theatrical filled evening, which starred Broadway Star Elaine Stritch, was a huge hit!! 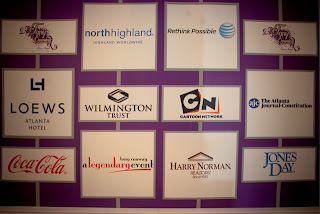 Our team did a fantastic job at this memorable event!! ****Photos courtesy of our fabulous Nancy Jo McDaniel!!! 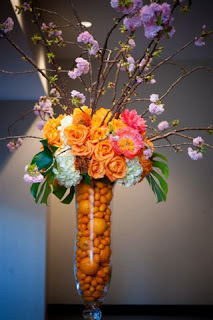 This entry was posted in Alliance Theatre, event decor, event design, events, floral, loews hotel, nancy jo mcdaniel, Sophia Lin. Bookmark the permalink. Dr. Seuss Goes to War….and More!!! 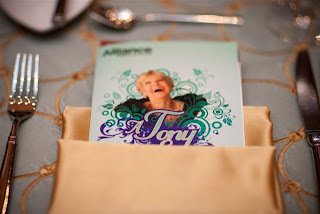 We did the cutest event this weekend for the William Breman Jewish Heritage & Holocaust Museum in Midtown Atlanta. They have a new exhibit called “Dr. Seuss Goes to War….and more!” featuring some of Theodor Seuss Geisel (Dr. Seuss) original works that he did while he was the chief editorial cartoonist for the New York newspaper PM from 1941-1943. The beginning of the exhibit (the first photo above) has more adult friendly historical facts and original material from two private collectors, together with material on loan from the Holocaust Museum in Houston. The end of the exhibit (the second photo above) has a ton of kid friendly, interactive activities that feature more of his current work. If you have kids, please take them to this interactive exhibit. I promise they will love it!! The opening Gala featured a dramatic entrance with a large Seussian inspired arch and tuffula inspired trees in the existing planters. Three truffla trees were at the center of the room as you entered the foyer. Our colorful painted bullseye panels were flanked by large Dr. Seuss graphics. All these elements made a dramatic tranformation to the room. Overall, the opening gala was a huge success with a little over 350 attendees. This entry was posted in A Legendary Event, Dr. Seuss, event decor, event design, William Breman Jesish Heritage Musuem. Bookmark the permalink.